A good set of metal tongs is the best thing you can have in the kitchen. Nothing beats them when you need to flip a steak, mix veggies in a marinade or pick toast out of a toaster oven. They give you a great amount of control (you do NOT want to cause a hot oil splash), and enough distance to keep your hand out of the heat. 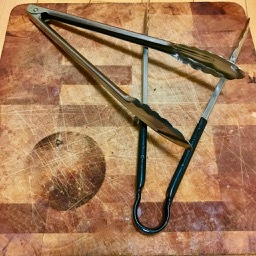 A good pair of tongs should have a good spring to them, have maybe a 30º angle when fully open and feel a little weighty, NEVER flimsy. A too-wide angle will mean that you’re squeezing it closed all the time, which will make your hand cramp up, and a flimsy one just won’t hold anything very well. I found mine in some random kitchen stores. Make sure you test before buying, and I would recommend staying away from any that are made for the BBQ (too long for indoor cooking) or anything with that metal ring that keeps it closed. For some reason, they tend to be too wide and really cheap. Mortar and Pestles are a lot like Kurt Russell characters: the bigger and rougher, the better. You want a mortar and pestle with super rough ridges, made out of granite. These are the most versatile, as opposed to the marble and wood variety, which in my opinion do little less than look good in your kitchen. A big granite one will be able to grind up hard spices, wet ingredients like garlic, or large dry ingredients, like dried fish. 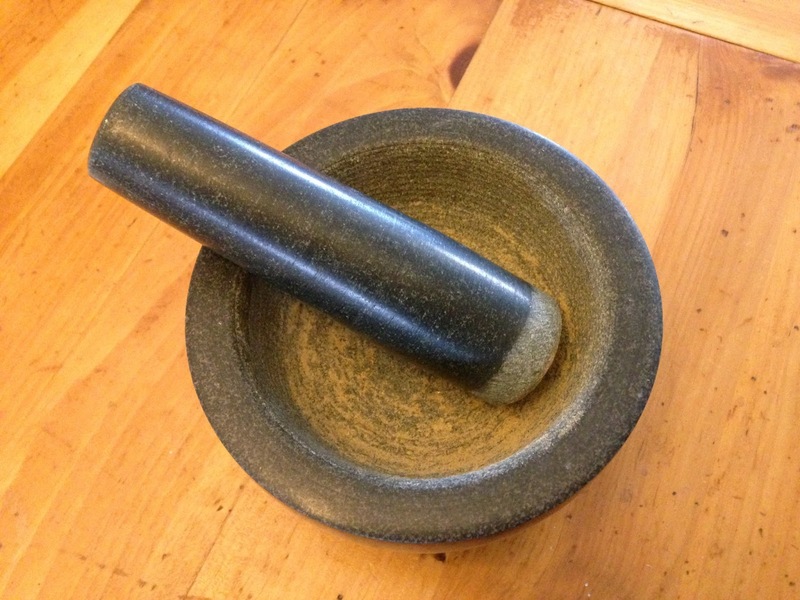 A large mortar and pestle can be made to pound multiple ingredients into a paste. Spend the money, (in my case $40 at Winners) and get one that will last forever and cover any job where grinding and mooshing are involved. 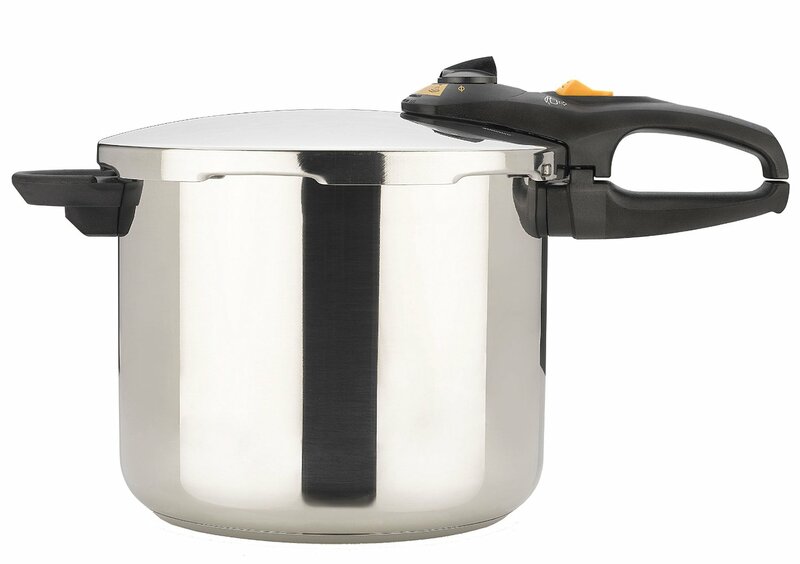 The pressure cooker I have is the Fagor America Duo 10-Quart Pressure Cooker/Canner. I did a bit of research online and this is one that was recommended by America’s Test Kitchen. It cooks evenly when used as a regular soup pot and is easy to use. It’s also easy to see if it’s under pressure from across the room. ATK actually recommended a size down, but this one fits canning jars, and I do a bit of canning every summer. So far, I’ve found an excuse to pull this thing out once a week for stocks and stews. I love it. This device has saved my life, possibly literally. My hatred of overcooked food means that I will often undercook things. My hungriness means that I will often eat this undercooked food. 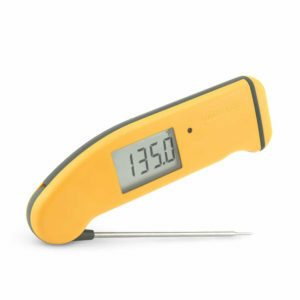 A Thermapen is one of those kitchen gadgets that seems overpriced until you get one. Then you wonder how you ever lived without it. I use mine every time I cook meat or fish. ESPECIALLY when I cook fish. It is insanely accurate, spits out a reading in 2 seconds and only needs to be inserted about 3mm, which makes it suitable even when cooking thin slices of meat. NEVER EAT DRY TURKEY AGAIN, PEOPLE! !